The University of Kentucky has a growing commitment to being one of the top research institutions in the nation by pursuing excellence in interdisciplinary research and creative efforts that not only enrich lives, but also address the most important challenges of the Commonwealth and beyond. Serving over 5,000 UK undergraduates each year, despite being only four years old, the Department of Writing, Rhetoric, and Digital Studies (WRD) has quickly established itself as both an emerging area of strength in creative endeavors, as well as a hub of interdisciplinary research and projects that cross traditional boundaries. A new and exciting learning space called the “Digital Distillery” is the department’s latest effort in cultivating and supporting scholarship at the undergraduate level. The Distillery is a learning and working space as well as a central hub of information and support for students who are interested in pursuing research in digital studies, working on multimedia projects of their own, and more. “For a student who is working on a project in one of her classes in WRD, this is a space where they can come in, either during or after class, and use the Macs or the video equipment,” said Jeff Rice, chair of the Department of Writing, Rhetoric, and Digital Studies and the Martha B. Reynolds Endowed Chair in WRD. 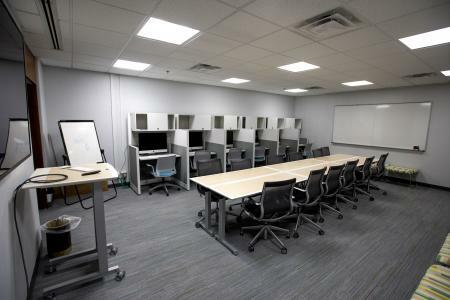 Located on the 13th floor in Patterson Office Tower, the multipurpose room serves as a classroom, study lounge, and a studio. The area is equipped with flat screen TVs, projectors, several Mac computers loaded with software, and even podcasting equipment. One of the many plans in the works is to set up data analysis equipment so a student who wants to do research on how trends work on Twitter, or how Facebook uses algorithms will have a space to do it. The Distillery will also be a space for faculty to utilize. A common slogan heard in the department is “Careers begin in WRD,” and the Digital Distillery is meant to contribute to this concept. The new space is designed to help integrate more opportunities for students to develop portfolios by giving them the resources to engage in real industry practices in writing, communication, and digital studies, while also strengthening interdisciplinary learning. Most importantly, the Distillery provides WRD majors with a physical presence where they can find support and can call “home,” Rice said. “The idea is that they see themselves as not just students, but scholars, and people with ideas worth developing and pursuing,” he added. Rice also said the department hopes to offer scholarships to support this effort. The original idea for the Distillery began with Jenny Rice, associate professor in WRD. A few years ago, Jenny Rice had the idea to create a collective for people who are interested in digital studies and she called it the Digital Distillery. 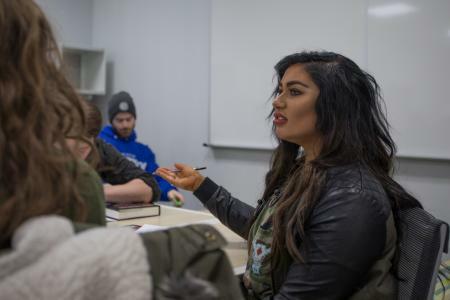 She along with Doug Boyd, director of the Louie B. Nunn Center for Oral History at the University of Kentucky Libraries, and others, met and talked about possible interdisciplinary projects that could come out of this collective. 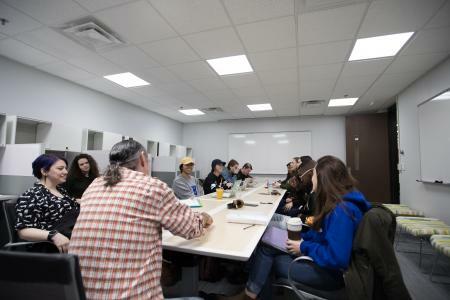 Two courses were taught in the Distillery this semester, a capstone course taught by Brian Mcnely, and a documentary production course taught by Tom Marksbury. Mcnely and Marksbury are both associate professors in the Department of Writing, Rhetoric, and Digital Studies. Learn more about the WRD major and department by visiting: wrd.as.uky.edu .